Here is a link to my latest tubadylan video. 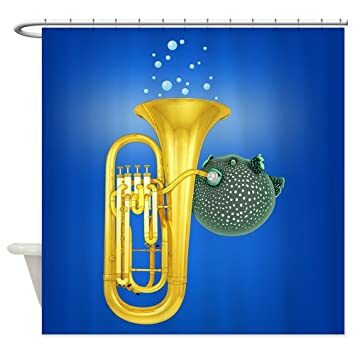 If you leave a comment, you will be entered to win this incredibly blue puffer-fish playing tuba shower-curtain. You won’t want to miss it! Please comment on the video. Have a great day. toobagrowl wrote: I don't listen to a whole lotta 'tuba centric' music, but my overall fav 'tuba album' is probably the Meinl-Weston Sextet album. As much as I love the tuba, I don’t often listen to tuba music for casual listening either. Sometimes, when I’m really in the mood, I listen to it at night. I don’t think I’ve ever listened to tuba music in the car, despite having Apple Music for the last few years and having access to everything. Has anyone actively listened to tuba recordings while driving or exercising? I wonder. Dylan King wrote: Has anyone actively listened to tuba recordings while driving or exercising? I wonder. I end up listening to lots of instrumental music (orchestral, bands, any other ensembles...) and then just zero in my ears on the tuba. I'm much more interested in hearing good "real" tuba playing in action than I am hearing solos full of low farts, high squealing, and multi phonics. bort wrote: I end up listening to lots of instrumental music (orchestral, bands, any other ensembles...) and then just zero in my ears on the tuba. Yeah, I do the same thing -- zero in on tuba in ensembles. Love the sound of a well-played tuba with a great sound in the context of an ensemble of some type -- quintet, wind band, orchestra, etc. That's what made me pick the tuba -- the way it sounds in an ensemble setting. bort wrote: I'm much more interested in hearing good "real" tuba playing in action than I am hearing solos full of low farts, high squealing, and multi phonics. Well then you all have never listened to the great Harvey Phillips and Rich Matteson and their Matteson-Phillips Tubajazz Consort records. They are so good that I regularly hear them played on jazz radio stations. So superb you will even wonder if you're listening to tubas. This is just excellent jazz that happens to be played by tubas/euphs. These recordings were made years ago and they still hold up. I heard one of the tunes just yesterday on the radio in the car and at first it was just a jammin tune on the radio - didn't even dawn on me at first it was a tuba / euph group with rhythm section and I was wondering who the group was. And then it struck me that it was all tuba and then that it was the famed MPTJC. I too don't really care for or listen to tuba records - but these guys (long gone unfortunately) just rock and the proof is in the pudding when one of the best jazz stations in the nation plays their stuff regularly during prime drive time. I'd also put Sam Pilifan's Traveling Light CD in the same league. That one gets played a lot even on mainstream radio stations in the Chicago area and you even hear it in stores during the Xmas season. I confess. After really thinking about it, I’ve exercised to Tricky Licks by Jim Self, and played a few tracks from Travelin’ Light at my wedding, almost eleven years ago. 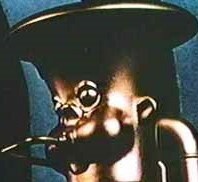 I would have to say that, when bringing up jazz tubists, I have to go with Ray Draper's 'A Tuba Jazz'. Some people I've talked to criticize his tone, but I think his inflections and style match it perfectly.